I just don't use it anymore. This enclosure will take any G-EV drive and allow you to use it with thunderbolt speeds! Here's the product highlights from the manufacture - Case Interface: Thunderbolt 10 Gb/s. We are always more than happy to help or make any issue correct. The item has been tested and found to be in 100% working order and great physical condition. Used as archive drive for production work. Tested and formatted for WindowsG-Technology G-DRIVE USB 3.0 4TB External Hard Drive (0G03594). Condition is Used. Shipped with UPS Ground. Trending at $79.00eBay determines this price through a machine learned model of the product's sale prices within the last 90 days. I have these SSD drives left over from a project. 2TB TERABYTE HITACHI HARD DRIVE IN A G-DRIVE 0G03594 ENCLOSURE. 2TB (TERABYTE). 2TB G DRIVE DRIVE EXTERNAL HARD DRIVE FROM G-THECNOLOGY. 1 X 2TB EXTERNAL DRIVE. EXTERNAL AC ADAPTER. 1 X USB 3.0 -. 1 X USB 3.0 INTERFACE CABLE. G-Technology 4TB G-DRIVE USB G1 USB 3.0 Hard Drive. Condition is New. Shipped with USPS Priority Mail. G-Technology 0G03234 G-DRIVE mobile USB Portable USB 3.0 Hard Drive 2TB 5400 RPM. Condition is New. Shipped with USPS Priority Mail. G-Technology G-DRIVE Thunderbolt & USB 3.0 Desktop Hard Drive 4TB (0G03050). Condition is Seller refurbished. Shipped with USPS Priority Mail. Does not come with box but comes with Power Supply and USB3 cable. Thunderbolt Cable not jncluded. 4TB GDRIVE WITH THUNDERBOLT, EXTERNAL HARD DRIVE FROM G-THECNOLOGY. 4TB (TERABYTE). 1 X 4TB EXTERNAL DRIVE. 1 X THUNDERBOLT -. 1 X THUNDERBOLT INTERFACE CABLE 1 X AC ADAPTER. EXTERNAL AC ADAPTER. 1 X USB 3.0 -. Drive Sleeve. -DC IN t12v. -18in 7-pin ATA. We will make it right! USED G-Technology G-DRIVE USB 4TB External Hard Drive MAC/Win. Housed in an aluminum enclosure, the G-DRIVE USB G1 features data transfer rates of up to 165 MB/s and a rotational speed of 7200 rpm, both of which allow for quick file access and fast data transfer speeds. G-TECHNOLOGY MOBILE USB-C 1TB EXTERNAL PORTABLE HDD G DRIVE BRAND NEW SEALED . Condition is New. Shipped with USPS Priority Mail. 4TB capacity of portable storage. Weight 0.30 lbs / 0.14 kg. USB-C ready; USB 3.0 and Thunderbolt™ 3 compatible. Interface USB 3.1 Gen 1: Up to 5Gb/s. Connector USB Type-C. Find out more at support.g-technology. Trending at $124.99eBay determines this price through a machine learned model of the product's sale prices within the last 90 days. Perfectly working G Technology G-RAID 4TB external HDD. Includes original box and cables as pictured. This has been formatted for xFAT 32 to read on both Mac or PC. 6TB storage capacity handles digital video, music and photo files. Thunderbolt and USB 3.0 ports for ultimate high-speed data transfer. Integrated heat-sink for quiet operation and cooling. Limited 3-year warranty. G-Technology G-Drive Q - 7200RPM FireWire 400/800 USB2.0 SATA 1TB G-TECH WITHOUT ANY ACCESSORIES. ITEM TESTED WORKING. G-Technology G-DRIVE External Hard Drive 2TB (USB 3.0/FireWire800/eSATA) Mac. Condition is Seller refurbished. Shipped with USPS Priority Mail. Tested and working. Comes with power supply only. Barely used drive , great condition . Drive and cable only . G-Technology G-RAID 2TB,External,7200RPM (0G00271) NAS. Condition is Used. Shipped with USPS Priority Mail. PCB: G_SLIM_JMS578 REV. 1.0 141006. LaCie Porsche 2TB USB 3.0 External Hard Drive Enclosure. G-TECHNOLOGY G-DRIVE Case /Enclosure Onl y. No HDD included. all original parts and accessories. Parts are not to be removed or swapped. Ideal for high-speed data transfer and available here as 6TB, G-DRIVE USB is Mac OS-compatible and can be easily reformatted for Windows. High speed USB 3.0 for universal, high-speed data transfer. Solid, stylish all-aluminum case for durability. The Model is 0G10310. This is a 500GB SSD. G-Technology G-DRIVE USB 3.0 8TB External Hard Drive (G Drive USB G5). Condition is Used. Shipped with FedEx Ground or FedEx Home Delivery. G-Technology G-Drive Mobile with Thunderbolt 1TB Portable Hard Drive, NEW! This is a Brand New G-Technology G-Drive Mobile with Thunderbolt 1TB Portable Hard Drive in need of a New Home! Please check out the photos for more details and as always Thank You so much for looking and please take the time to look at the other items I have posted for sale, I have something for everyone!!!! 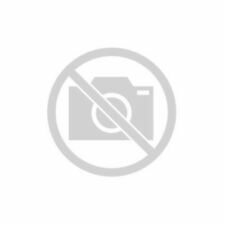 5 out of 5 stars - G-Technology G-Drive Mobile with Thunderbolt 1TB Portable Hard Drive, NEW! 5 product ratings5 product ratings - G-Technology G-Drive Mobile with Thunderbolt 1TB Portable Hard Drive, NEW! The Model is 0G06053. It is 100% Genuine and Authentic. The G-DRIVE ev RaW drive and SanDisk Ultra Trek flash drive work with both PC and Mac computers. Drop Resistant: Your content deserves to be protected. The G-DRIVE ev Raw portable drive provides shock resistance of up to 1.5m. Learn more about the G-Technology 0G02723 (GDEVNA10001BDB). Model0G02723 (GDEVNA10001BDB). G-DRIVE ev Hard Drive. SeriesG-DRIVE ev. FeaturesFeatures USB 3.0 for use as a single direct-attach drive and SATA connector for use with the G-DOCK ev storage solution. G-Technology G-DRIVE EV RAW 1TB USB 3.0 (0G04101) Hard Drive UPC 705487199208. Condition is New. coupled with the bumper, can withstand a 1.5m1 drop. As part of the evolution series, it can either be used as a standalone device, inside the ev All Terrain Case2, or with storage solutions such as the G-DOCK ev with Thunderbolt, or with the G-SPEED Shuttle XL with ev Bay Adapters for ultra-fast transfers and editing. MANUFACTURER REFURBISHED G-DRIVE 4TB EXTERNAL HARD DRIVE w/ THUNDERBOLT. The 4TB G-DRIVE with Thunderbolt operates using a 100-240 VAC power adapter. Enhanced 4TB storage capacity perfect for storing a variety of files. 2TB Capacity. Rugged and Lightweight. USB 3.0 & SATA Interfaces. Data Transfer Speeds up to 136 MB/s. Shock Resistant up to 4.9' / 1.5m. G-Technology 4TB G-Drive, 7200RPM, Up to 165MB/s Transfer Rate #0G03050. MPN: 0G03050. G-DRIVE w/ Thunderbolt external hard drive. 310-six seven 2-eight 9 nine 1. Integrated heat-sink for quiet operation and cooling. G-Technology 0G03514 G-Speed Studio XL 8-Bay Thunderbolt 2 24TB Storage Solution, POWER CORD, USER GUIDE, THUNDERBOLT CABLE. Part Number 0G03514. Model: 0G03514. 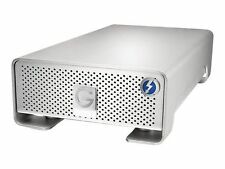 G-Speed Studio XL Thunderbolt 2 24TB Storage Solution. 4TB OF STORAGE. 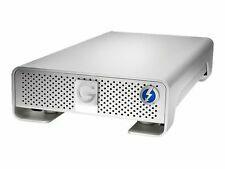 G-DRIVE with Thunderbolt 3 – An ultra-fast, high-performance storage solution featuring Thunderbolt 3 and USB 3.1 Gen 1 interfaces in an all-aluminum enclosure. The G-DRIVE desktop storage is perfect for storage-intensive applications like audio/video editing or digital photography. Manufacturer Part Number: 0G03614. Compatible with the G---DRIVE ev and G---DRIVE ev SSD. Removable USB drive is Evolution Series-compatible. Bus-powered eliminates the need for a separate power connection. Manufacturer Part Number: 0G05849. 32TB OF STORAGE. Along with Enterprise-class hard drives for enhanced reliability and a trusted 5-year limited warranty, the G-SPEED Shuttle XL with Thunderbolt 3 is the ultimate storage solution for demanding video workflows on location and in the studio. G-RAID with Thunderbolt is a high-performance, removable dual 7200RPM Enterprise-class hard drive storage system featuring both Thunderbolt 2 and USB 3.0 connectivity. G-RAID with Thunderbolt is backed by a standard 3-Year limited warranty and unlimited free technical support by representatives experienced with the latest content creation applications. G-Technology G-Drive USB 3.0 G1 External Hard Drive 6TB - Free Ship! G1 External Hard Drive 6TB. G-Technology G-Drive USB 3.0. See pictures for more detail. New - Open Box. 4.5 out of 5 stars - G-Technology G-Drive USB 3.0 G1 External Hard Drive 6TB - Free Ship! 5 product ratings5 product ratings - G-Technology G-Drive USB 3.0 G1 External Hard Drive 6TB - Free Ship! With up to 24TB of transportable storage you can easily carry to an on-site location and back to the studio. Contains up to 24TB of storage. Dual Thunderbolt 3 ports. Built-in hardware raid for versatile storage solution. A year later, SkyMall had arrived! Our first ever catalog was published and distributed to passengers on Eastern Airlines flights, and a cultural institution (that’s us! If we do say so ourselves…) was created.Show More. 4TB Storage Capacity. It's easily formatted for PCs and most users will use the standard USB-A 3.0 cable. and has 1Tb of hard drive space. USB Type-C and USB Type-A Connectivity. Two Types of USB Cables Included. • (4) - HARD DISK DRIVE UNLOCK KEY. G-Technology 6TB RAID1 External Hard Disk. You are buying on a G-Technology 2-Bay External Hard Drive with RAID0 and raid1 support. It has USB, FW800 and eSATA ports. G-Technology G-DRIVE ev RaW v2 USB 3.0 2TB Portable Hard Drive 0G10199 NEW!